In 20 stunning photos, the glory of Kodachrome comes through in the work of Fortune's distinguished photographers. We present a gallery of our favorites. Kodachrome film, which Kodak announced this week it will no longer produce, has a nearly 75-year history as a beloved medium for both amateurs and professionals. That includes the many distinguished photographers who have worked for Fortune, who valued the film's warm, rich tones made famous in Paul Simon's song. 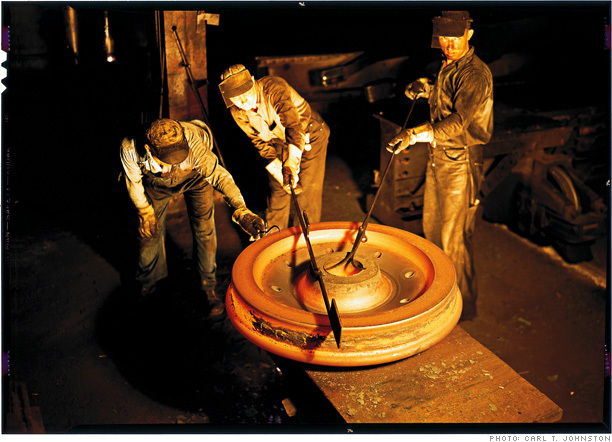 We've selected a gallery of Fortune favorites, which starts with this Carl T. Johnston photo from 1939, showing Standard Steel workmen in Burnham, Pa., welding red-hot metal into a train wheel for Baldwin Locomotive.